We have a wide and varied repertoire from classical, light classical and jazz to modern covers. With over 50 hours of music in our library, you will find something you love, and our music will set the perfect soundtrack for your function. We will also accommodate specific requests where possible and if necessary, create an arrangement of a piece of music that may have special meaning to you, or that has relevance to a particular occasion. Our clients are encouraged to work with us to ensure that your preferences and requirements are taken into consideration. This ensures that the music we provide for your function is tailored to your needs. For wedding ceremonies, the classical section is divided into Entry of the bride, Signing of the register, and the Recessional. The pieces in our jazz and modern covers sections have been requested for any part of a wedding ceremony. 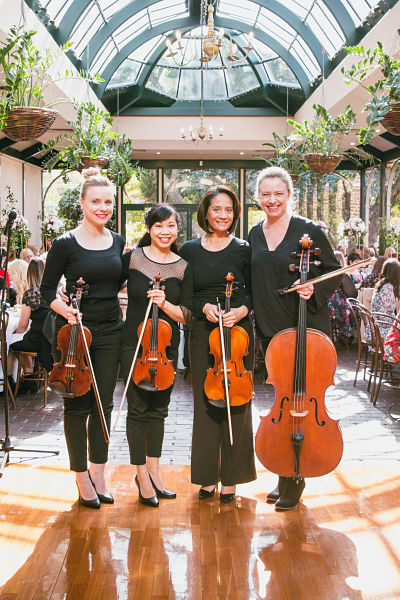 For wedding pre-dinner drinks and receptions, corporate functions, events or parties, you can select a particular style of music, or a combination of styles. On this page is a list of our most requested pieces for wedding ceremonies, corporate functions and parties. The list of pieces below is not everything we play. To see our fuller repertoire, please click here. If you have difficulty playing the audio or video files, please contact us.